Charleston native Douglas Balentine has been drawing and painting for as long as he can remember. He headed back to the Lowcountry to explore the natural and historic beauty of the area. Balentine’s need to look beyond the horizon and delve deeper comes from his interest in interconnectedness and the human spirit. From a larger collection inspired by the beach at Sullivan’s Island over the last decade and a half, he explains while creating this portrait he thought a lot about the model’s African heritage and how the ships coming and going from Charleston’s port today are navigating the same routes that slave ships might have once used. 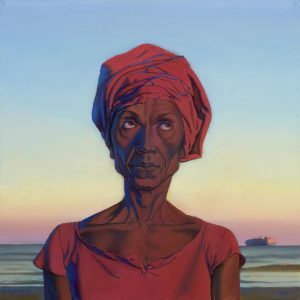 Cargo is part of the Beyond the Horizon exhibit on display at the Franklin G. Burroughs – Simeon B. Chapin Art Museum now through September 10.